(ThyBlackMan.com) In recent weeks, considerable turmoil has emerged among some elite members of the Civil Rights community. Publicly aired expressions germinating from PBS’s Tavis Smiley and the National Action Network’s President Rev. Al Sharpton, in which both parties have accused the other of working against the interests of the African-American community in an effort to garner favor from members of the political class – Former President Bill Clinton in relation to Smiley and the current Head of State Barack Obama with respect to Sharpton – have created a stir within many African-American quarters. These contentious allegations along with further subtle articulations generated by Sharpton suggesting that perhaps entrepreneurial aspirations partially serve as the catalyst for some of the actions of those within the Civil Rights community – Sharpton’s reference to the desire of some activists to boost book sales – have raised questions regarding not only the legitimacy of these claims but implicitly and perhaps more importantly; those with respect to the axioms which undergird the concept of authentic leadership. In the face of a national economic crisis in which the African-American populace has experienced considerable hardships, as reflected in essentially every statistical category that would signify the social standing of a people, it is of immeasurable importance those individuals – established and emerging – who function under the premise of working to bring forth relief to this population, be in possession of specific intangible qualities if their ascendance to the position of “leader” is to lend strength to the effort to which they profess to support. Such a circumstance prevails, as the African-American community as a direct result of an extended legacy of state sponsored oppression – slavery, Jim Crow Laws, judicial misconduct etc… – visited upon this group by United States government institutions, in which Black peoples’ capacity to experience social affluence by way of gainful employment, property ownership, the right to vote and the partaking in any other number of civic activities that would advance a group’s societal position was – and is still to some extent – severely compromised, has not the collective understandings from a philosophical and organizational standpoint that would enable it to produce a movement that would function to improve its status, absent the presence of dynamic leaders who have the ability to direct this ethnic class and its resources to this end. Indeed, the history of those of African ancestry within the context of the United States reflects the emanation of such figures as Malcolm X and Dr. Martin Luther King Jr. – among others – who were able to galvanize many of the group’s members and bring into service the communities’ institutional structures in working to obtain greater degrees of prosperity for this population. Additionally, these individuals were able to instill in their followers, a philosophy that would serve to provide the basis by which faith in the group’s ability to achieve a desired goal could be fostered. It is through an analysis of the conceptions and actions of such leaders and in applying these attributes within the context of a contemporary movement that would seek redress for African Americans through governmental intervention, the fabric of authentic leadership may be revealed, and in so doing perhaps function to discern the viability of the current reigning leadership within this community. The authentic leader working within the parameters of any political system, in attempt to amass legislative and or policy results that would ensure greater standings for a disenfranchised people understands the fundamental interest of the politician is embedded in his or her desire to acquire and maintain power. A genuine leader desiring to exact influence upon elected officials, inherently bound and motivated by such a dynamic, comprehends he or she – along with those who follow – must pose a fundamental threat to the political survival of the governing entity if any substantial gains are to be attained by the group. It is almost exclusively under the condition of political loss – which for the politician constitutes a state of emergency – such figures respond to the grievances of those dispossessed populations existing among their constituents. This paradigm prevails, as the allocation of capital to any particular group necessitates the removal of resources from another; creating a circumstance where by the politician is forced to make a calculated determination as to the ultimate political toll he or she may incur as a result of maneuvering within the confines of this precarious arrangement. In light of this reality, only those groups that not only demonstrate the capacity but also the unequivocal resolve to inflict considerable harm to the political standing of the elected official will witness the entertaining of its interests. In exercising the inherent power encapsulated in this principle, clear delineations with respect to the relationship between the leader as “perpetual agitator” and the governing body as the “target” of this activity must remain perpetually fixed. Leadership that functions to the extent the would be “agitator” compromises this position by aligning him or herself with the politician in assuming the role of “quasi-advisor” or “aid” to the elected official – a position Sharpton has conceivably embraced within the Obama Administration – has not the leverage to effectively extract from a government what is needed for the people he or she represents. A purported emancipator who positions him or herself in such a manner cannot truly serve the full interests of the people, as the individual’s duplicitous station as “Freedom Fighter” and government operative constitutes an inherent conflict of interest. In such an instance the leader’s loyalties are divided between the political figure and the group he or she directs. 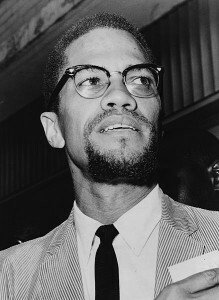 The authentic leader – as was the case with respect to both Dr. King and Malcolm X – forges no such relations with nationally elected officials, as such a leader understands, his or her primary function is to inspire political fear among the members of this circle, thus creating the conditions under which the leader’s followers may realize their collective ambitions. It was such a relationship between the African-American leadership of the sixties and the elected officials of that time which assisted in ensuring the passing of the Civil Rights Act of 1964. A leader’s adoption of the position of “political aid” to an elected official representing the very institution that must be lobbied if greater dimensions of social justice are to be procured for a people, suggests that perhaps the interests of that individual lies not squarely with those he or she represents but rather in another area. An organization’s capacity – irrespective of its declared mission – to bring into existence the conditions its members wish to realize is in some measure predicated on the financial status the institution holds. However, while a movement must be supported monetarily, the head of such a campaign must not be a pronounced capitalist. A leader operating under the dual role of “liberator” and ardent capitalist invariably permits his or her desire to experience financial gain to trump the impetus to impose those measures upon the ruling class that would help to ensure the social elevation of his or her followers. The leader in this instance simply works stealthily to realize his or her own financial interests – very often through dealings involving the individual’s supposed adversaries – in the name of the cause to which the individual claims to serve. While Dr. King and Malcolm X understood the need for and practical application of financial resources within the context of a protracted struggle against institutional forces, seemingly in endless supply of such capital, neither leader’s legacy bespeaks an ethos wherein financial impropriety resides. These principled human rights activists never experienced the inevitable tangential long term financial rewards – as Tavis Smiley conceivably may – accompanying the continued orchestrating of corporately funded media productions in which the egregious plight of the African American is debated and articulated by leading scholars and activists, seemingly void any real intention of harnessing the ideas proposed therein to the extent a formidable movement would surface. Nor did Dr. King or Malcolm X accept financial contributions to their respective organizations – SCLC and the OAAU – from corporate entities they themselves deemed as purveyors of racial injustice, as reflected in these institutions’ business practices directed toward African Americans, as has Al Sharpton with respect to the funding the National Action Network has received from General Motors, Chrysler and American Honda; all entrepreneurial bodies – an attending corporate branch in regard to Chrysler – the preacher has previously classified in this manner. In the absence of those uncompromisingly virtuous leaders, as defined by the manner in which both Malcolm X and Dr. King courageously sought to uplift humanity in challenging those forces which have and continue to preserve and further cultivate an unbalanced social order, Americans of African descent have fallen from the ranks of those formidable groups in which government figures had to contend, to that of a rather prostrate population, officials very seldom take seriously. Executive Branch declarations, in which a comprehensive plan succinctly detailing those initiatives the government intends to enact in working to alleviate the execrable condition in which the African-American community finds itself, are often replaced by carefully crafted speeches designed to obscure the addressing of these issues, as the unique plight of those emerging from this group are presented within the context of that of the larger society and their dashed hopes in achieving social wealth. Attending legislative mandates that would be employed in addressing the needs of Black populations – if in fact law makers were engaging a politically revered group – give way to religious gatherings in which the singing of, “We Shall Overcome,” over locked arms and gleeful smiles abound. This once substantive vocal expression – rooted in civil disobedience – symbolizing a peoples’ continued pursuit of liberty, now reduced to a mere mockery of itself, in the face of illusionary movements which function to only curtail the acquirement of such an objective, often facilitated and directed by the very leaders entrusted to bring this desired intention to fruition. If the African-American public is to experience a resurgence to the extent significantly greater levels of social, political and economic justice prevail among its peoples, only those leaders who may be classified as authentic must be permitted to head its fight. For the obtainment of such a societal state, will not be secured by paradoxical preachers or media operatives and must not be predicated on a desperate hope an independent unilateral act spawns from an arch political figure seemingly apprehensive to even publicly mention the name of Dr. Martin Luther King Jr. The procurement of universal prosperity for those of African ancestry will only find its expression when such populations are guided by those principled and loyal leaders, who dare to bring forth such a dream, by any means necessary. Mind blowing analysis… thank you.